The legendary champions who once banished a terrible demon to his cave with the contract of fidelity, faith and eternal friendship, have disappeared. Undead creatures are now gathering here, attracted by its growing power. Can you forge the contract again before the demon is set free again? This Hero and Monster Set for Descent: Journeys in the Dark Second Edition brings new variety to your game. 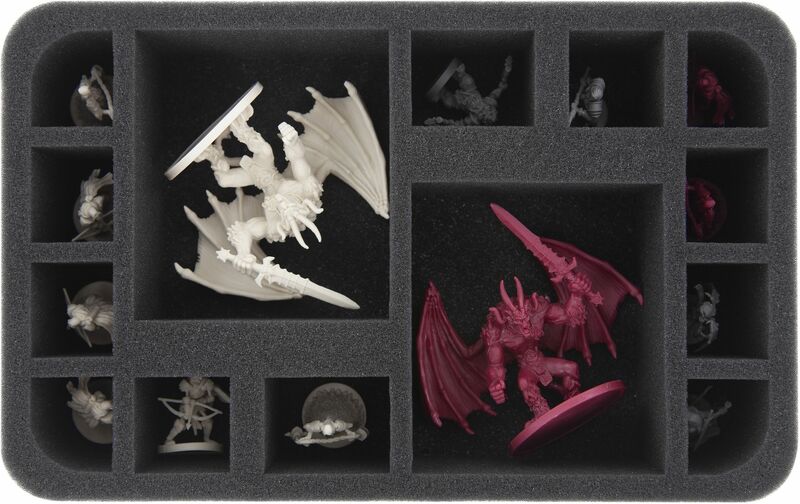 In order to avoid that the new heroes get lost as well, we designed this foam tray for you. All 14 figures of the expansion are stored here safely and clearly. Two large compartments offer a soft cave for the two Demon Lords and make sure that wings, horns and swords remain unharmed. The Crow Hags and Skeleton Archers, along with your heroes Zyla, Grey Ker, Jonas the Kind and Krutzbeck, are distributed among the other 12 compartments. Because of the miniature-precise cut the figures will not slip around during transport. Colors of painted figures will not flake off. Sensitive details, such as arches and axes, also remain intact. 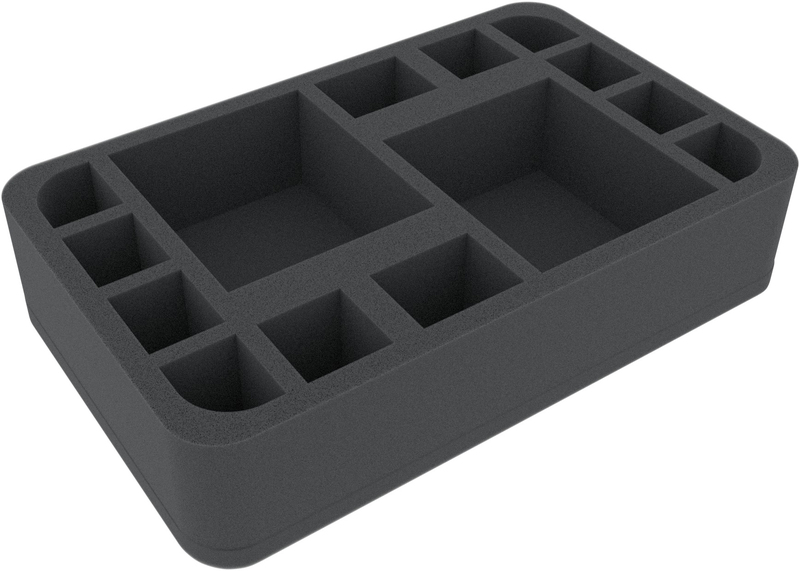 The half-size foam tray measures 275 mm x 172.5 mm x 60 mm. The individual compartments have a usable height of 50 mm. 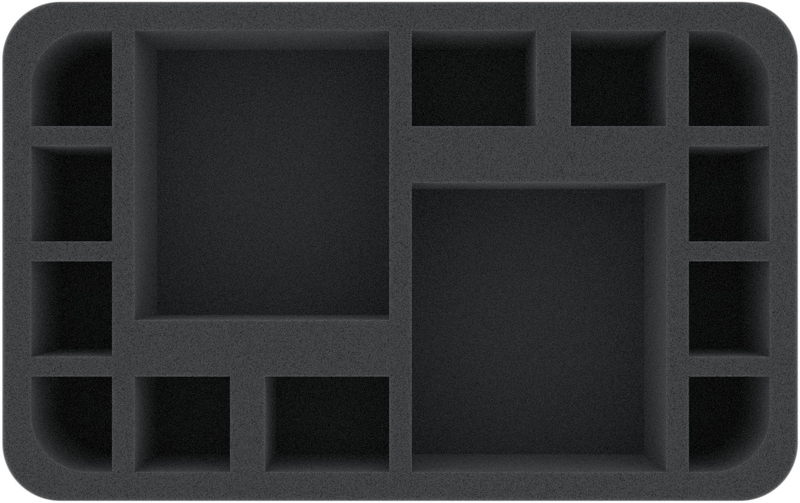 A 10 mm thick foam base adds the mat up to a total height of 60 mm.